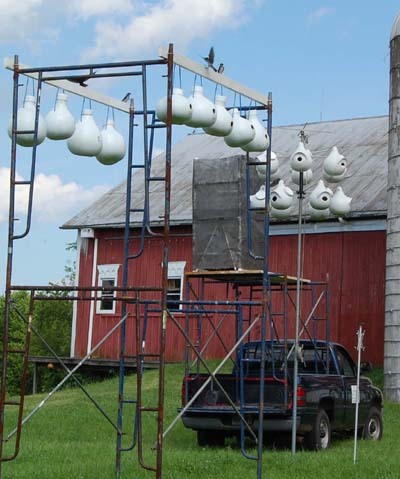 We first tried to attract purple martins with several natural gourds in 1996. 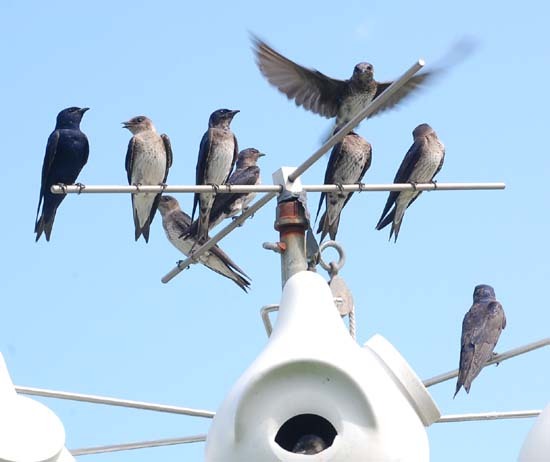 Several martins were seen inspecting the site in the early fall migration and 6 birds returned in the spring of 1997, resulting in one active nest. 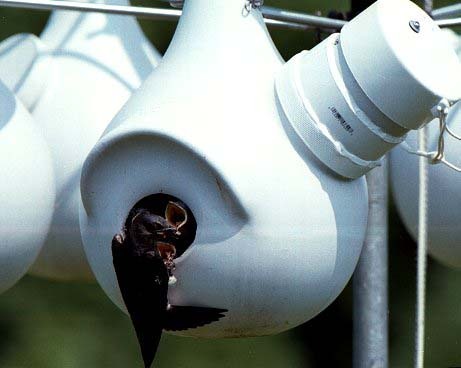 In 1998, there were two simultaneous nestings. One was successful, the other resulted in extremely thin shelled, broken eggs. 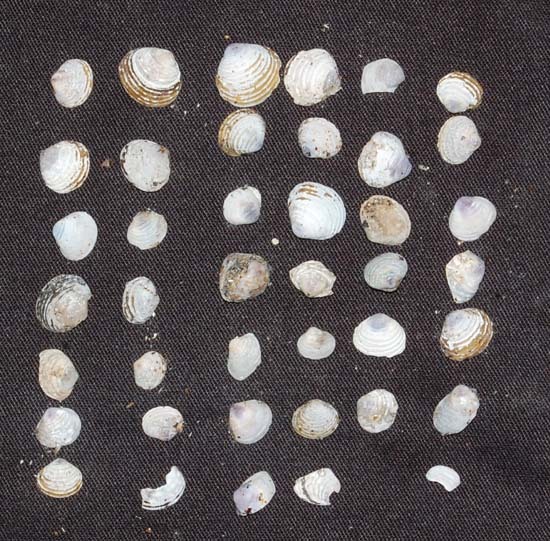 When the gourds were cleaned at the end of the season, the successful nest was found to have at least 20 small clam shells in the debris, while the failed nest had none. 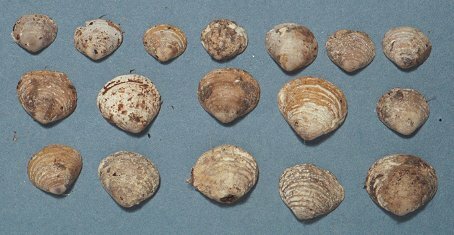 The shells were, apparently, gathered at the creek, some distance away. 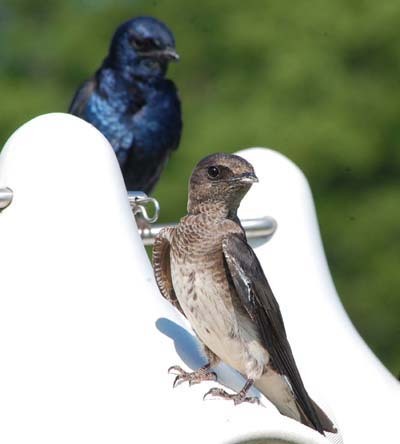 Next year I will grind shells and provide a calcium feeder as I had in the past for the swallows and bluebirds. 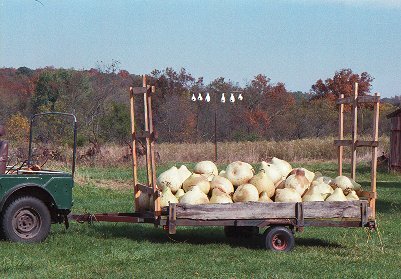 In preparation for a growing colony of martins, we grew a large patch of gourds in 1998, which are now curing in the barn. The two dozen larger ones (14+ inches wide and 18+inches high) will be cleaned next month and the seeds saved for future use. The seeds used last year were three years old and 80% viable, so growing every year isn't necessary. 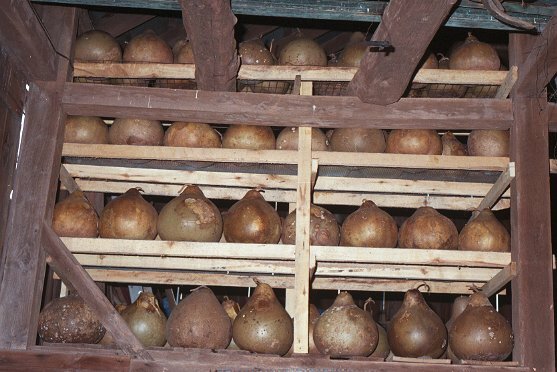 We start the gourds indoors in March, putting them out in the sun each nice day and bringing them inside at night. Martins seem to share my appreciation for natural gourds, rather than those expensive metal houses. 2004 update The huge gourds that I harvested in 1998 actually proved less attractive to the martins than the average size gourds that were previously available to them. This wasn't obvious at first because the two different sizes were on different racks and I thought the martins were just selecting the previously used site. But, now it seems clear that bigger isn't better and 14" diameter gourds may be too large. 2005 update This year the martins are in super gourds on a pole, since I didn't have time to prepare natural gourds with cam housings or replace the old rack which is leaning precipitously. A gourd cam has recorded the nesting of a second year pair, although I have reused the tapes each day, so there is no complete record. The five nestlings are doing great, as of today, July 26, 2005. Even the runt has caught up with its siblings. Actually, the term, "runt" should be reserved for the last hatched who then don't successfully compete with their larger nestmates. In this case, the last hatched seemed to receive as many feedings as its siblings and always appeared robust, despite its much smaller size. 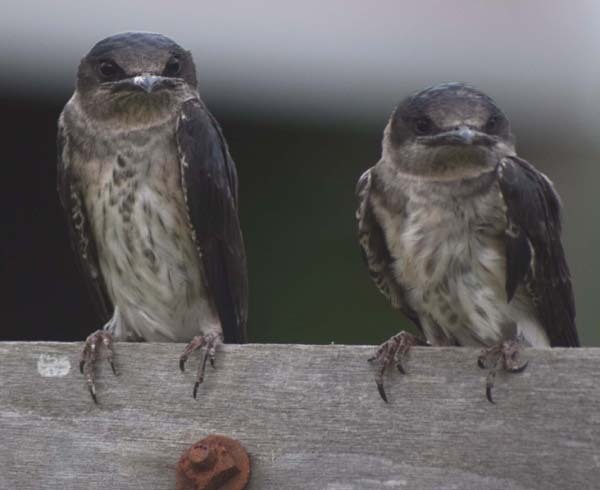 Now, I can see no difference in the size of the nestlings, who should soon fledge. They also seem to be doing just fine in today's intense heat. I had reservations about using the plastic super gourds, but, the young seem quite comfortable on video - as much so as nestlings in my cedar boxes on similar hot days in the past. No other nest box species are currently nesting, except the kestrels, who are incubating a second brood in their tower. 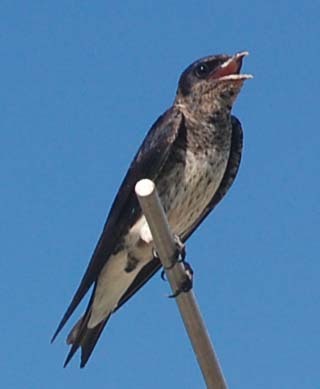 The barn swallows still have several broods, but that is in the much cooler swallow room. Most of the 12 super gourds have had their crescent entrances enlarged. 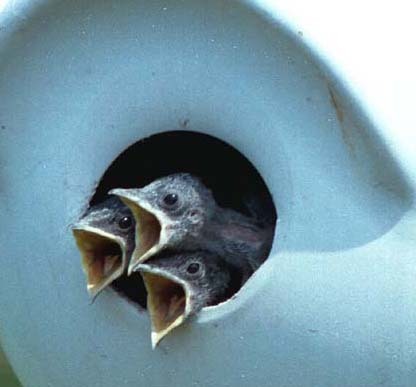 The various starling resistant openings have been a boon to those who have previously had starling infested housing. 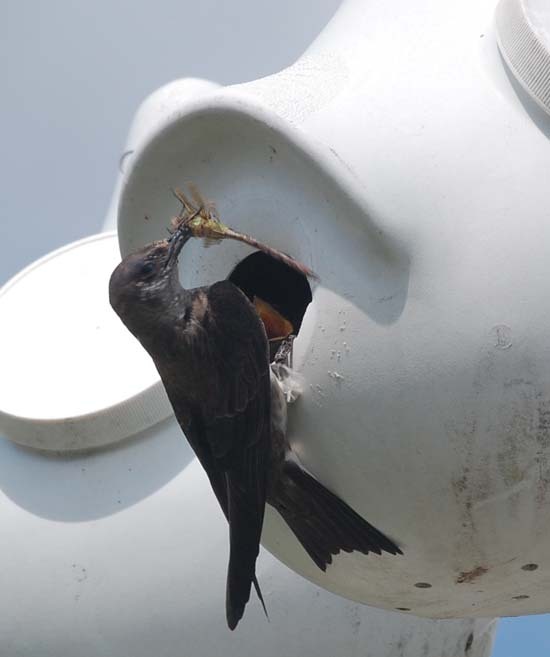 However, starlings haven't been a problem with my super gourds so I and my martins prefer the larger round openings. 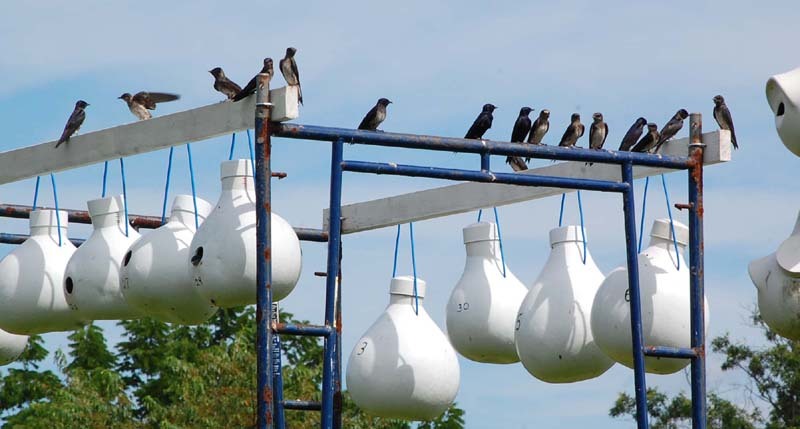 Starlings were a problem with my large natural gourds, but have shown no interest in the plastic gourds as long as I offer them a large decoy house (flicker box)and then shoot or trap those starlings that claim this decoy box. 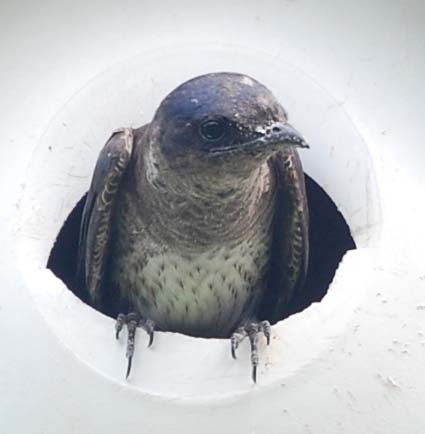 As long as the deep wooden flicker box is available (not claimed by another pair of starlings), any visiting starlings looking for a nest site will go to the decoy box and not even enter the less desirable plastic gourds. 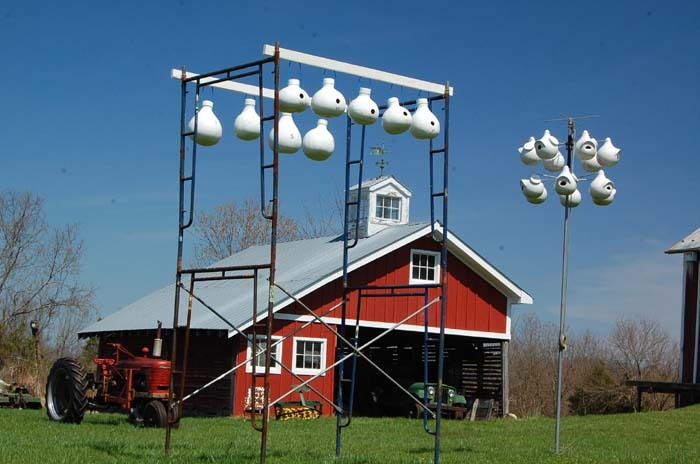 I even put up the super gourds before the martins return and haven't observed any starling actually enter one. I have seen several land at the entrance and peer inside. However, I am NOT suggesting that others should not use starling resistant entrances on martin housing. Many people swear by them and would not think of returning to round holes. 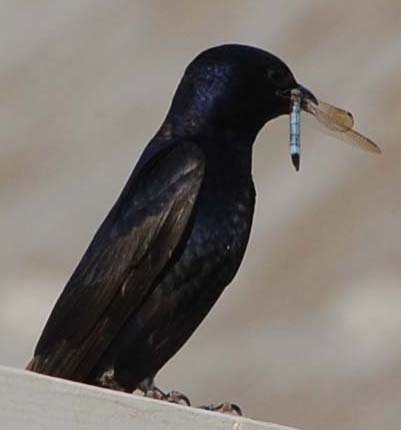 But, in my yard, the use of the decoy box, in conjunction with the repeating traps and the shooting or trapping of starlings claiming the decoy box has eliminated the starling problem when using plastic gourds. 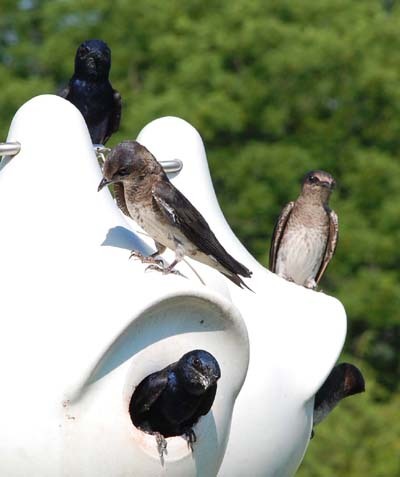 Next year, when I add natural gourds, I may, again, have a problem with starlings, but the plastic gourds don't seem to be a favored site for starlings in our yard. 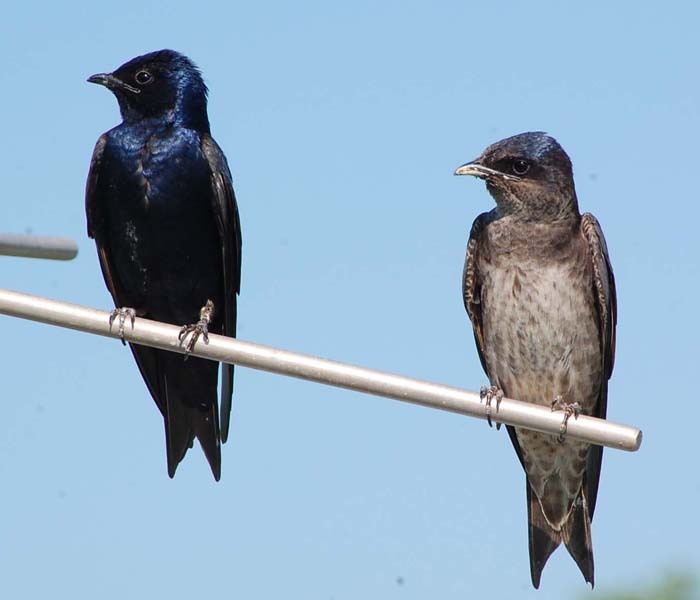 Luckily, their most favored sites are the several 2" holes in the barn wall which lead to repeating starling traps. 2013 Update The martins have been doing fine in recent years, but more gourds will be needed for 2014. I have no desire for a very large colony, but, apparently more housing is needed in this area. 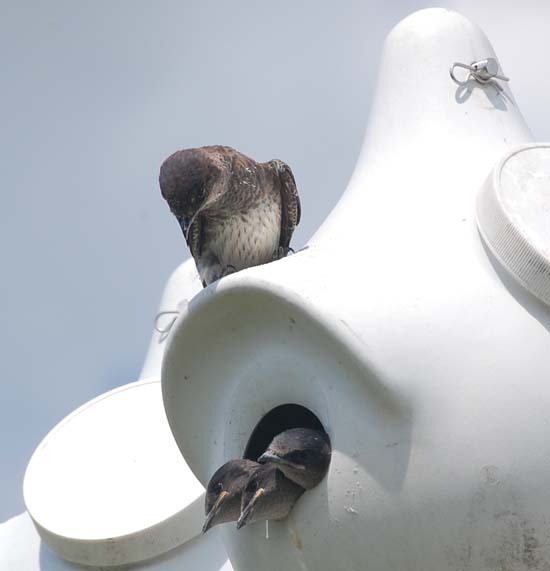 The 2013 nesting was uneventful, unlike that of the barn swallows. 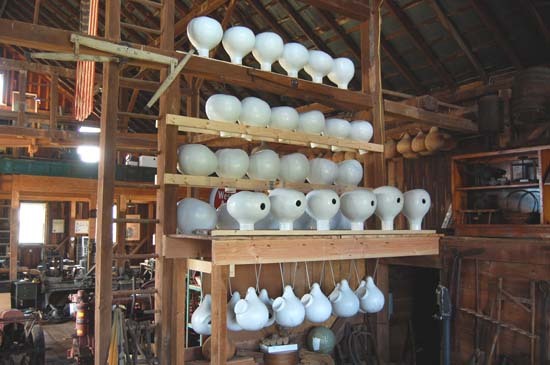 Thirty large natural gourds with cam ports were prepared for 2014. Even though ground oyster shells were provided, the martins are still bringing many clam shells from the creek. Also, the fresh green leaves that are always brought to the nest appear to all be the same species this year. Next year I should determine which species and how far they travel to gather these leaves. 2014 update - This year the first tier of large natural gourds has been provided on a scaffold rack. If needed, three more tiers can be added on a third scaffold section in future years. 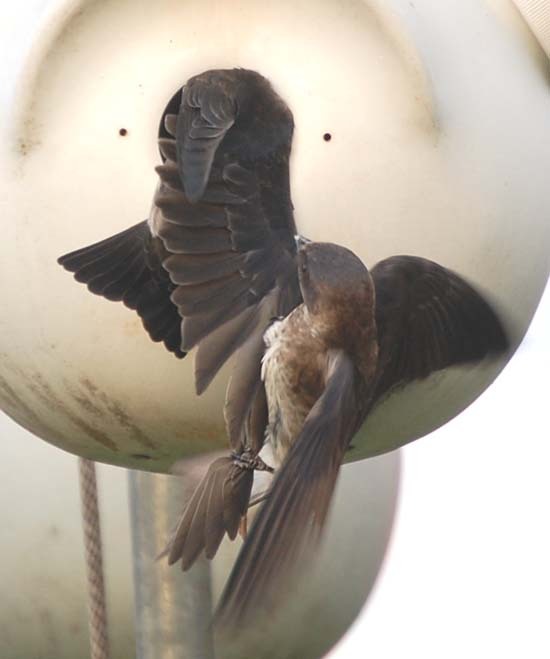 I prefer climbing up to the nests rather than lowering them for the infrequent nest checks. 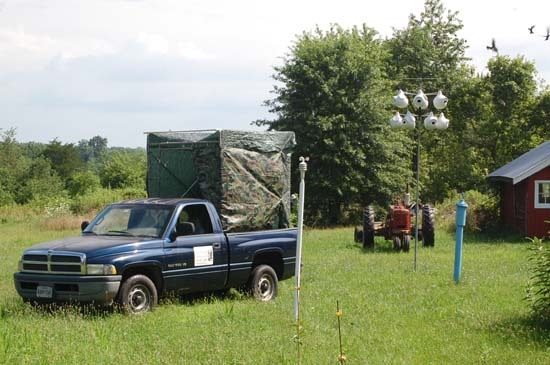 Closeup photos were taken from a portable blind mounted on a truck. 2016 nesting- There were twenty successful nests this year. Monitoring was minimal, due to Diane's health. She was diagnosed with cancer in March and lost that battle in December. 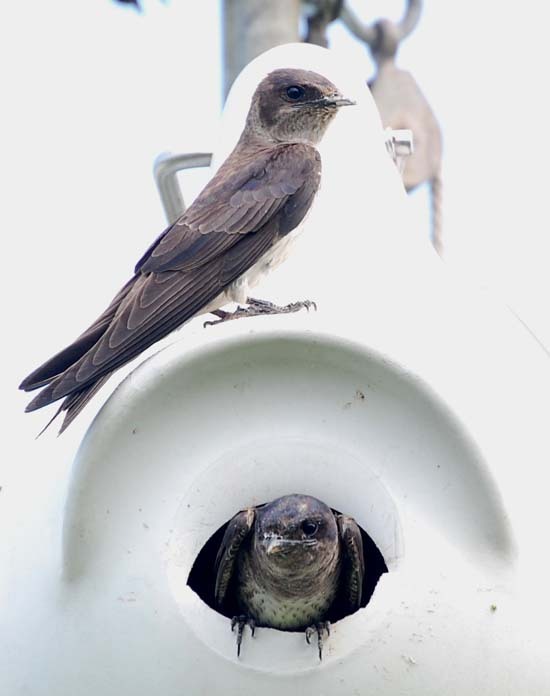 Two premature fledges in the photo below were placed on a grain drill where adults soon began bringing prey to them. 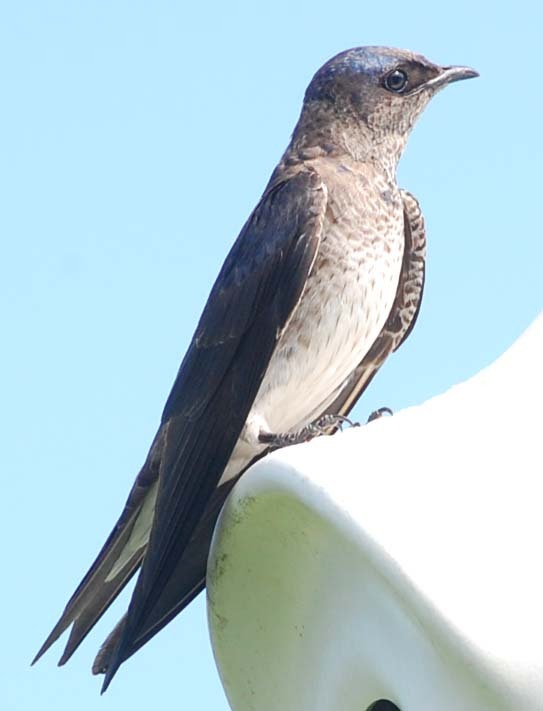 One of the birds was first seen clinging to a cement wall and crawling around much as a chimney swift would do. ©1999 - 2017, American Artifacts and Richard Van Vleck, Taneytown, Maryland.